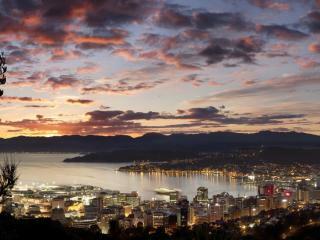 This is your Wellington haven, right in the heart of the city. Spacious and comfortable, CityLife offers luxury accommodation and privacy right in the heart of the city. The 70 Studio and 1 & 2 Bedroom Suites are furnished with quality fittings and are a welcoming sight after a day of touring and sightseeing. Friendly and professional staff are on call 24 hours a day to make your City Life Wellington stay one to remember. Your window to Wellington set right on Lambton Harbour, the Copthorne Hotel Wellington, Oriental Bay enjoys picture postcard views, day or night. The Hotel is just a short stroll to many of Wellington's finest attractions including Frank Kitts Park, City to Seas Bridge, civic square and City Gallery. The 118 rooms are service by 24 hours room service, restaurant and cocktail bar. Grand Mercure Wellington is located high on The Terrace, offering spectacular views over the city and harbour. In a quiet setting, this charming boutique hotel features 111 rooms, a restaurant, bar, indoor heated swimming pool, gymnasium, sauna and 6 conference rooms. Guests have only a short walk to theatres, restaurants, the award winning Te Papa Museum and some of New Zealand's best shopping. Ibis Wellington has a fresh and funky look, with colourful couches in the hotel lobby and a great mix of contemporary New Zealand artwork on display. Ideally located on Featherston Street in the heart of Wellington CBD the hotel is easy accessible by bus, train and taxi. The Ibis Wellington features 200 guest rooms and full hotel style facilities, including an on site restaurant and bar. Conveniently located in the heart of cosmopolitan Wellington opposite Wellington Harbour, InterContinental Wellington offers all the comforts, service and luxury you would expect from a five-star hotel. InterContinental Wellington has excellent city shopping right on the door step, and just minutes from all leading attractions. Situated in the very heart of Wellington, the James Cook Hotel Grand Chancellor reflects the beat of a dynamic city and a thriving capital. Offering guests a great choice of rooms and suites, this New Zealand accommodation also has a restaurant and bar, day spa and is conveniently located close to shopping and the business district. Novotel Wellington is located conveniently in the heart of the city, only a short walk to Te Papa and Wellington Museums and the waterfront. The hotel also has direct access to Lambton Quay via a shopping arcade. Features include well appointed rooms, a restaurant, bar, business centre, gymnasium and valet parking. Great New Zealand accommodation in a great location.